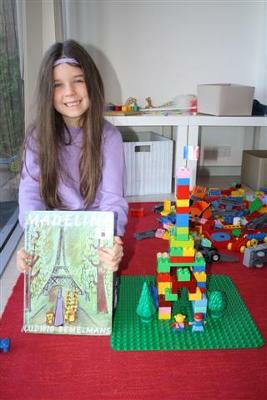 We studied France using the book Madeline by Ludwig Bemelmans. We built mini Eiffel towers from hard card stock, dressed in French clothes, ate French food (croissants, different cheeses, etc) and learnt to say some basic words in French. The children also used Duplo to build their very own Eiffel tower. My preschooler and I just started studying cities around the world. I went to madebyjoel.com. 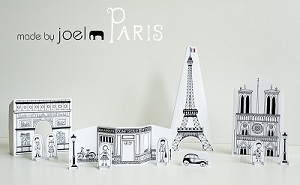 He has made a wonderful paper city of Paris at http://madebyjoel.com/2011/08/paper-city-paris.html. Just click on the free templates and print them. Delightful book showing different places in Paris. Then we acted out being a crepe vendor and patrons. The kids practiced saying "sil vou plais" and "merci" and of course enjoyed the crepes! Picture book reading - 15 min. 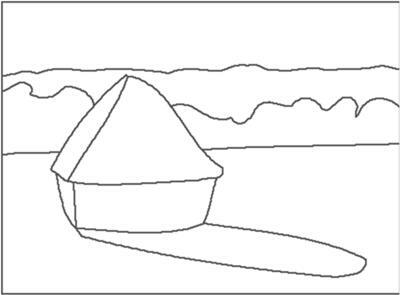 Craft or art project - 20 min. Snack while listening to music - 15 min. France - I greeted each child with "Bonjour!" as they entered and used "merci", "apres vous" and "pardon" where appropriate. Craft - I gave each child a paper plate that had 9 different circles drawn around the edge and one in the middle. Under each circle, I wrote the name of a color in English and in French: black-noir, brown-brun, purple-violet, blue-blu, pink-rose, red-rouge, green-vert, orange-oranj, yellow-jaune ("jon"). I squirted one small blob of poster paint on each corresponding circle and a larger blob of white in the center. 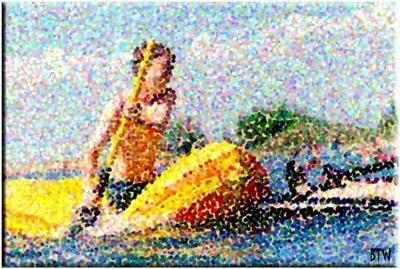 The children were given the outline of a French pointillism painting. I showed them on my computer 6 different paintings and then left it on the one they were to copy. 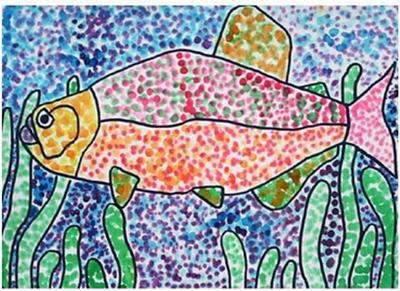 They each got several q-tips to dip in the paint and make dots on their papers to fill in their painting. 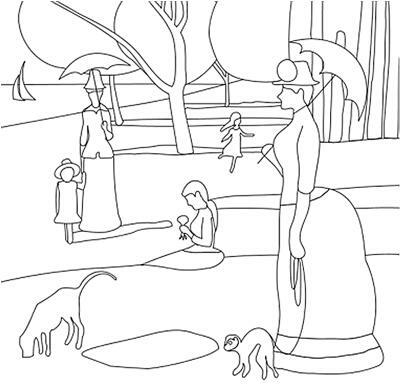 Depending on the age of the children, more complicated drawings can be used. They loved mixing the colors with white to make shades of color! For snack, we had croissants, grapes ("ra-zau") and cheese ("fromage"). "Bon appetit!" As they left, I said "au revoir".